Creating and protecting ownership and economic opportunity for all. 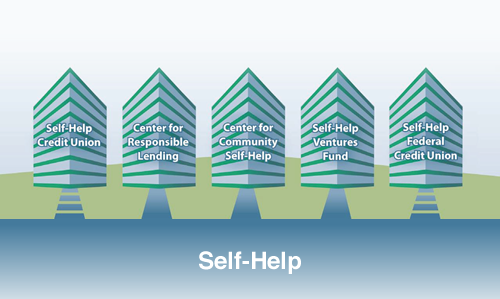 The nonprofit Center for Community Self-Help (or Self-Help) combines several organizations that together provide financing, technical support, consumer financial services and advocacy for those left out of the economic mainstream. These entities include: Self-Help Credit Union, Self-Help Federal Credit Union, Self-Help Ventures Fund and the Center for Responsible Lending. Since Self-Help’s founding in 1980, we have reached out particularly to female, low-income, low-wealth, rural and minority communities across North Carolina, Washington D.C., California and many other states. We provide responsible financial services through our network of state- and federally chartered credit unions. We develop residential and commercial real estate to support community and economic development. Over time we have demonstrated that low-income borrowers pose no greater credit risk than other borrowers. Our borrowers have proven their determination to repay their loans, build their businesses, improve their communities, and build wealth through home ownership and home equity. The Center is a charitable nonprofit 501(c)(3) organization that develops and coordinates Self-Help’s programs, raises resources, and advocates for economic opportunity. Self-Help Credit Union is a member-owned, federally insured, state-chartered credit union in North Carolina. It raises market rate deposits from members to make commercial, consumer, and home loans. Self-Help Credit Union is a nonprofit entity. Its members include individuals, nonprofit and religious organizations, and other socially responsible people and institutions. The Ventures Fund is a nonprofit 501(c)(3) loan fund capitalized with loans and grants from foundations, religious organizations, corporations, and government sources. It manages Self-Help’s higher-risk business loans, real estate development, and home loan secondary market programs. The Center for Responsible Lending is a national nonprofit, nonpartisan research and policy affiliate. CRL is dedicated to protecting home ownership and family wealth by working to eliminate abusive financial practices.